To date there have been over 1000 studies and publications on the therapeutic potential of H2, showing it to be beneficial for over 170 disease models. These studies also conclude that H2 has the potential to be therapeutic for virtually every organ. Almost everyone has a health issue in today’s society. There are so many remedies, health products, claims, and advice out there about what to do about each one. It can be confusing! One of the best parts about H2 is that it is ONE thing, with MULTIPLE benefits, for MULTIPLE problems. PLUS – one of the best ways to consume H2 is dissolved into water. We NEED water! So can get something with a WIDE range of benefits, while drinking something you were going to drink anyway! WIN-WIN! Nearly EVERYTHING can have side effects or even be harmful in excess amounts. Even water can deadly in excess amounts. Science doesn’t have to be confusing to be accurate! Our focus is to provide scientifically accurate information, the most current research, and experienced analysis of the various hydrogen producing methods. If you find the best substance in the world’s food products, it will be the Antioxidant. To prevent disease and improve health by increasing the immunity system and natural healing through antioxidants is vital for all of us. Because starting the treatment after getting a disease, it will be a waste of time and cost will be matter and also it will give a hard time for us and to our family. Which organization in the world has studied the most about human diseases? The Johns Hopkins University of Medicine that produced 39 Nobel Prize winners. They have announced very important 2 things about human diseases. Currently, there are about 36,000 human diseases, and 90% of them are directly related to ‘Harmful Active Oxygen’. If we prevented harmful active oxygen causing 90% disease in our human body, we can prevent around 32,400 diseases. Is there a way to stop the harmful oxygen? The most prestigious scientific journal in the world is ‘Nature Madison’. The issue date June 2007 they have published a paper called, “The Hydrogen effectively removes harmful active oxygen even in small amounts,” by Professor Dr. Otashigeo. Henri Cavendish discovered hydrogen in 1766, but it was Dr. Otashigeo of Japan in 2007 that discovered the new value of hydrogen for everyday health. From then on, hydrogen began to be used in health care businesses. When it comes to antioxidant foods, vitamin C is recognized as a pronoun. The antioxidant effect of hydrogen is 176 times that of vitamin C. This is a truly surprising effect. In addition, vitamin C is water soluble but not in the fat, whereas hydrogen can even reach to the mitochondria and the brain within by passing through fat. There are 4 types of reactive oxygen: Superoxide anion, Hydrogen peroxide, Singlet oxygen and Hydroxyl radical. The hydroxyl radical is the most active and damaging of the cells causes cancer by destroying the cell’s DNA. Vitamin C cannot remove it, but Hydrogen can. About 1,000 international papers have been published about the effects of Hydrogen. To inhale hydrogen directly through one’s nose. Here is a way to drink hydrogen from water. Among them, the most convenient, economical and satisfying method is to use hydrogen in drinking water and for cooking, also the washing for all vegetable and fruits. But there is something needs to be noted here. It must contain at least 1000 ppb of hydrogen and ozone needs to be separation emission. Even though the product does not have enough hydrogen ppb in the market or cannot be released as ozone separately, the product is sold under the name of hydrogen water generator, so you need to check carefully. Dr. Kim’s KYK hydrogen water machine contents of up to 1,575 ppb and the ozone released separately. By Dr. Kim’s special instrumentation and philosophy, for 40 years from the 1980s to the spirit of craftsmen, the research of water science was objectively verified. 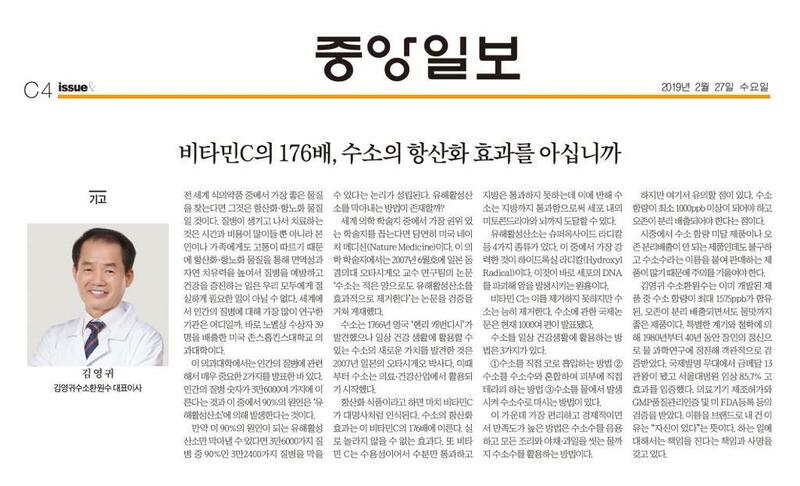 He won the 13 gold medals on the international invention stage and achieved 85.7% of positive effects from Seoul National University on the clinical trial with KYK Hydrogen water. KYK has a permit manufacturing of medical devices the license of GMP and quality control FDA registration was verified. The reason why Dr. Kim made brand by his own name is to show the “Confident.” Dr. Kim has the strong responsibility and mission of that he will take all responsibility for what he does.